A few years ago I read something concerning our hands and how differently we might act if every time we reached for something or touched someone, we saw "The Lord's" written across our palm. It got me to thinkin'. So on Thanksgiving morning that year, after putting the bird in the oven, I wrote a note to myself across my right palm. A gentle (or not) reminder of who I belong to. I had to choose how my hand was going to be used. To bless or to curse. To caress or to clench in anger. The words in red were not only a reminder of how I use my hands. It was a reminder of how I use my tongue. Every time I saw those words in red, I stopped to think before I spoke. To "speak the truth in love", or to hold my thoughts to myself. To gossip, or to edify. 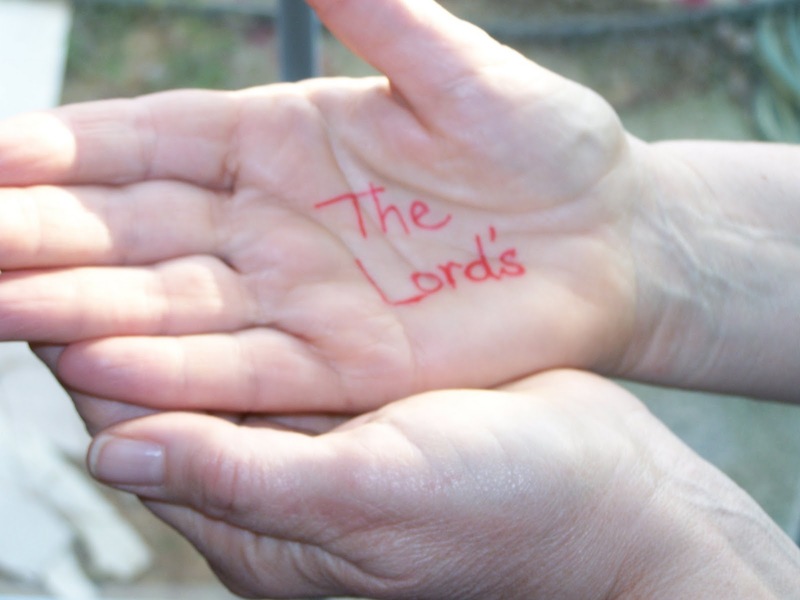 I won't always have "The Lord's" written across my palm. A load of dishes and it is all but faded away. But I WILL remember forever, the day "THE LORD'S", written in red, played a significant part of Thanksgiving, 2007. This post is as appropriate today as it was the 1st time I posted it, if not more so. Have a most blessed Thanksgiving, my friends, as we remember Him who is worthy of ALL our praise and thanksgiving. I must admit that if I saw those powerful words on my hands before I uttered words I would not utter in His presence, or behave in a way I would not behave in his presence, then I too would think more than twice before acting on impulse. The sad thing is He IS with me all the time and does see & hear me act unbecomingly ...thank-you for the reminder Cindy. This is great! I am thankful that these gentle reminders still pierce my heart, and nudge me towards a closer more sensitive walk with the Lord. May I never grow cold and insensitive to his convictions! bless you all over there on the shores of the big lake! Thank you for the powerful reminder as many of us head to family gatherings where relationships may or may not be strained. May each of us be a reminder of God's powerful presence and love! Simply beautiful. May you have a blessed Thanksgiving! I am thankful that your blog honors Jesus. It is a blessing to be able to read of your grace-filled life. Thank you for sharing so much...recipes, scriptures, music...life. I hope you had a wonderful time with your family! A Powerful, and beautifully written reminder! What a beautiful thought-provoking post my friend! May the LORD indeed help us all to live moment by moment for HIM by HIS strength and for HIS glory alone! Good post, Cindy. Would that we write those precious words across our hearts (and palms) every day! Maybe that would be a good tattoo!